I was cleaning up the house in the late afternoon when I happened to peek outside to see what the weather was doing. I spotted some glowing orange telephone poles from the kitchen, so I decided to head outside to see what the sky was doing for sunset. 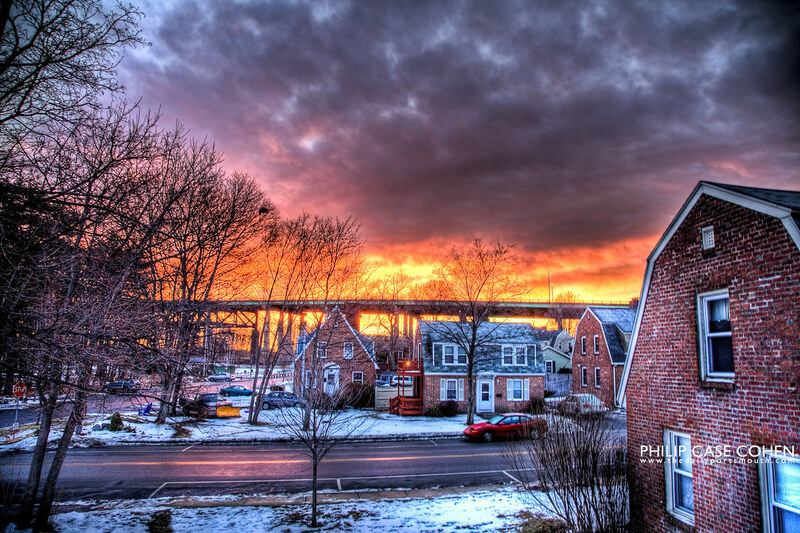 The Piscataqua River Bridge was glowing a fiery orange, so I decided to get a better vantage point by heading up to the attic and getting a better elevation. 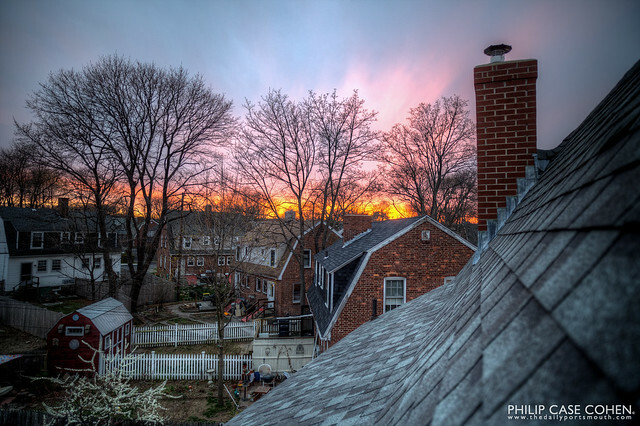 It was when I opened the skylight that I was greeted with the view of this incredible sky at sunset. What a difference a week makes! Last week we were reminded that winter is still officially here with a nice snow storm, which dumped 10 or so inches of snow around the seacoast. This week, we are eyeing temperatures that are predicted to climb into the 60s, a reminder that spring is only around the corner. My favorite part of winter is the moment when the skies clear and all the trees and fresh snow are still serenely undisturbed – it’s best when this is the morning after the storm and the skies are richly blue. The sky is a bit ominous still in this shot of the Great Cove Boat Club, but it’s better than nothing. In keeping with yesterday’s post, here are a couple fun shots from yesterday’s heavy snow storm. Above you can see the reflection of Market Street and the North Church in the glass of the storefront, along with some folks enjoying a stroll in the storm. 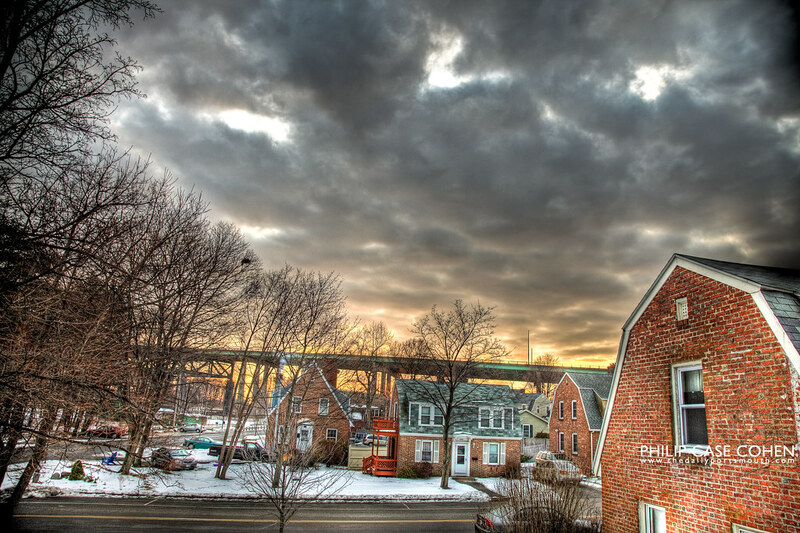 Below you can see the moody sky after the snow quieted down for the night, as seen from my 2nd story window. Portsmouth’s railroad (formerly part of the Boston & Maine Railroad) tracks run downtown from Islington Street, across Market Street and along the Piscataqua River all the way to Atlantic Heights and further on towards Public Service of New Hampshire’s power station (which can be seen generating a plume of smoke in the distance). The fresh snowfall, the blue sky that finally made its way out, and the cargo car made for a cool shot. The power plant is located on the banks of the Piscataqua River and can also be seen in THIS POST from the summer, I highly suggest you check it out. I wanted to share with everyone a taste of the video footage that I’ve shot over the previous year during my voyages around town (be sure to view fullscreen in HD). This is all footage shot with my Canon 5d Mark II camera, which I’ve had for just under a year, and is capable of HD video…but unfortunately I’m still learning and don’t really know what I’m doing beyond the still shots. I had fun compiling the footage, which has been set to Vampire Weekend’s song “Run” from their new album Contra. Please drop a note and let me know your thoughts! Today’s shots are a pair of sunrises from my stairwell in Atlantic Heights – the first shot (above) with an intense red glow and another more subtle, yet beautiful morning. I-95 can be seen in the distance. 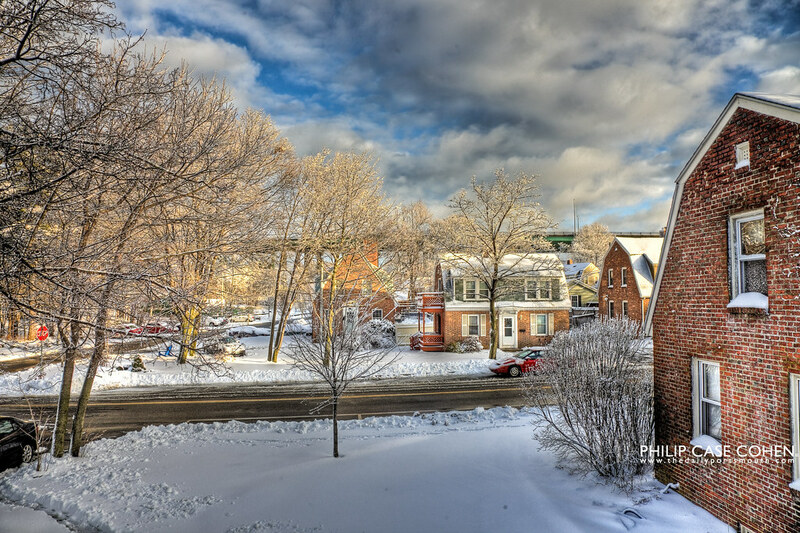 Here’s a third shot from after the snow storm on January 18th once the sun made an appearance and the snow was still sticking to the trees. 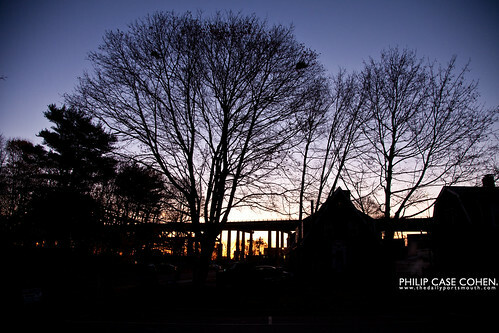 During sunrise, the first rays of sun peek out from just under the I-95 bridge from my window. I hadn’t seen this time of day in quite some time, I’m not usually awake until much later when the night sky is completely gone. This was a nice treat…maybe I’ll have to try it again soon. 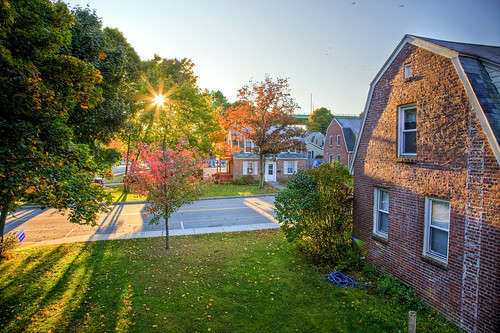 With the leaves doing their usual fall thing, the rising sun peeks through the tree along Kearsarge Way. Also hiding behind the tree is I-95 and the Piscataqua River Bridge…and this shot was taken from my stairwell in my quaint Atlantic Heights World War I home. The sun is coming up pretty late these days, so I actually catch the rising sun and get to see some beautiful colors.